Patricia Polastri, an assistant professor for management and technology at Texas A&M University-Kingsville, believes the palm trees and other bushes attract cockroaches and rodents. CORPUS CHRISTI, Texas (CALLER TIMES) -- First, Patricia Polastri made slideshows about the new vegetation planted on Ocean Drive near Cole Park and the roaches and rodents it could bring. 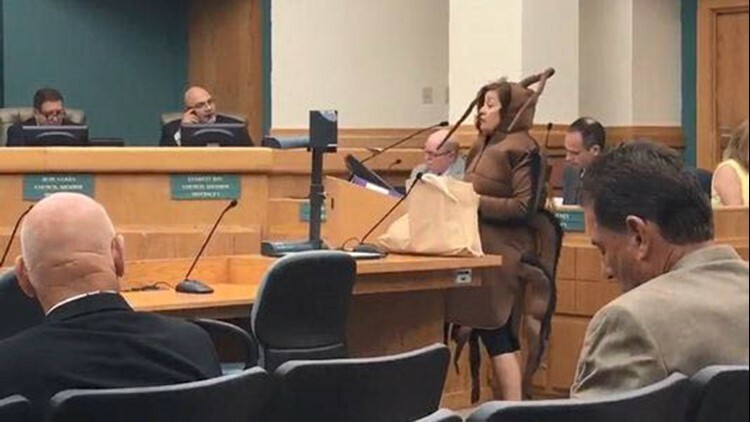 Next, she brought a plastic bag of dead cockroaches to a June City Council meeting and handed it to Interim City Manager Keith Selman. Now, Polastri has dressed like a cockroach herself to get her point across. "I lived there when we only had three palms in that section of Ocean Drive; now we have 35," she said. "In five blocks, we have 156 palms alone. The city is not going to take care of that." Since early 2018, Polastri has come to a number of City Council meetings to complain about the newer vegetation planted on Ocean Drive. She has lived there since 2012. Polastri, an assistant professor for management and technology at Texas A&M University-Kingsville, believes the palm trees and other bushes attract cockroaches and rodents. But it's not just the pests that she and other Ocean Drive residents are worried about. "Someone is going to be killed in that jungle. It’s becoming a jungle. I show that in the slides I brought today, how this thing is transforming, and nobody is taking care of that," Polastri said. After she brought the bag of cockroaches last month, she said Council Member Ben Molina walked the median with her. "He mentioned he didn't know where the roaches were coming from, which is why I'm dressed like a roach — to show him that I'm a roach coming from Ocean Drive," she said. "He also forgot to mention that we met in the middle of the day, and everybody knows that roaches and rodents are nocturnal." Molina said he has met and walked the median with Polastri before. He wanted to put himself in her shoes and "understand the issue coming from her side of the story." "At first, she said it was more than just a roach issue to her. She talked about public safety, she talked about mobility, people walking in and out of there," Molina said after the meeting's executive session. But as Molina started talking to Polastri's Ocean Drive neighbors, he said more people favored the landscaping than vice versa. "A lot of residents that do live in and around that area, and a majority of the people that reached out to me, are in favor of the landscaping," Molina said. "That’s why I didn’t push further to have the city address the landscaping issue there. Because for the most part, a lot of the residents were in favor of the landscaping." Council and staff should expect persistence from Polastri. She doesn't believe anyone will listen until someone is killed walking on Ocean Drive. "In the middle of the day, you don't see them; in the middle of the night, you don't see them," Polastri said. "The vegetation has grown too high, and people are totally invisible until they are actually on the road. "If an accident were to happen, I have enough information to provide to any lawyer when it happens that say 'the city has been informed about this.' "